ASBURY PARK, NJ, June 8, 2018 – The Asbury Park Music Foundation will once again host free concerts three days a week throughout the summer. Three separate series offer diverse styles of music appealing to all music lovers. Music Mondays at Springwood Park features a broad range of music that includes soul, funk, R&B, hip hop, and jazz. The Asbury Park Live series on Wednesdays showcases emerging rock bands. Every Thursday the Asbury Park Concert Band will deliver a big band sound. These 28 shows are supported by generous sponsors who bring the community together for free live music while also raising money for youth music education. A preview of the summer series will be included in the special “Sounds of St. Johns” fundraising event on Sunday, June 10 with performances from Chris Brown and the Asbury Park Concert Band. Details are available at Facebook.com/events/204251090391526/. 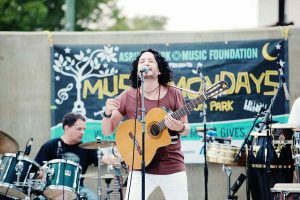 This free concert series takes place at the Springwood Avenue Park located between Atkins and Union Avenues every Monday from June 25th through August 28th (final show is a Tuesday). The headline performers include local favorites Ray, Goodman & Brown, The Soul Cruisers and many others. Supporting acts all have roots in the Asbury Park community. Last year’s series attracted over 4,000 attendees for 10 weekly shows and this year’s lineup is sure to surpass those numbers. Shows begin at 6pm and free street parking is available. The park is a short walk from the train station or downtown. Asbury Park Complete Streets Coalition will provide a free bicycle valet service. Bring your lawn chairs and blankets. In the event of rain, shows will move to the Asbury Park train station (announced on the APMF Facebook page). Sponsored by Gia Maione Prima Foundation, Inc.
Sponsors include MOGO Korean Fusion Tacos, Watermark, Pepsi, Ansell Grimm & Aaron, Stone Pony Summer Stage, Lakehouse Music Academy, Asbury Park Food Collective, OceanFirst Bank, Asbury Park Distilling Company, Pucker, and Crepe Shop. The generosity of these sponsors not only provide free concerts but also a donation to APMF. Last year, the sponsorships funded an upgrade to the Hip Hop Institute with a new sound booth and computer. This year funds will support a new Latin Experience Youth Music Camp being held in the summer at Lakehouse Music Academy. There is also a special benefit show in advance of the summer series on June 14 at the APMF space on 621 Lake Avenue. This show features Sonic Blume, Yawn Mower, Sentient Moss and Not UR Baby. Funds raised will be added to donation to the youth programs. Details at Facebook.com/events/444547882655766/. The Fourth of July show will feature music prior to the fireworks as well as an additional set once the fireworks ends. The famous Asbury Park Concert Band will entertain visitors for its 73rd season with musicians from the entire state participating. Each show is themed, including Broadway, patriotic, and big band jazz music. Another feature of the band is the special Children’s Concerts performed throughout the summer where talented students play with the band for part of the concert. Special seating on the Boardwalk is provided courtesy of Madison Marquette. These free shows are held on the Asbury Park Boardwalk in front of Robinson Ale House. This series is sponsored by Investors Foundation, Robinson Ale House and the American Federation of Musicians Performance Trust Fund and donations from community members.